Rock appears by the light of the glorious fire. 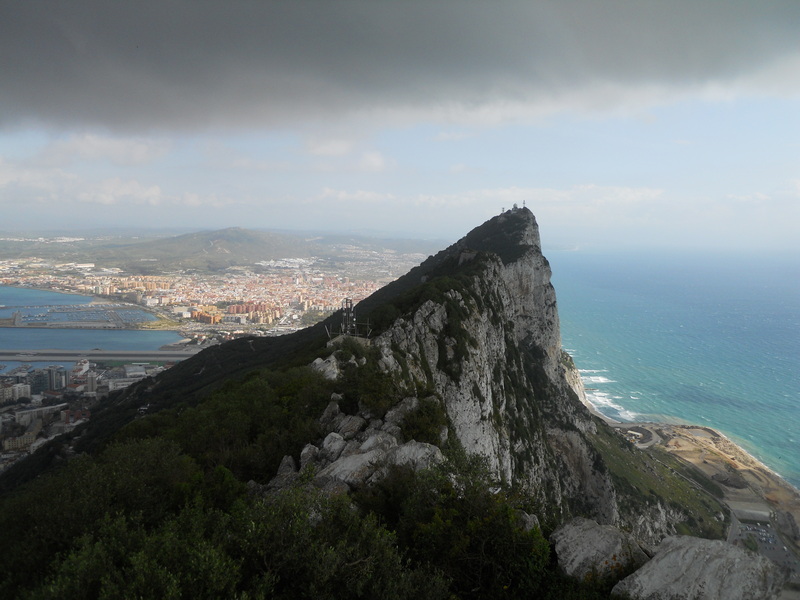 Thanks to the advertising of the Prudential insurance company, Americans have become familiar with the profile of the Rock of Gibraltar, and I thought I knew what to expect on my recent first visit to this British overseas territory. I was shocked to realize that my mental image of the rock was 180 degrees off! I have not recently experienced such a radical revision of my world map (up is down, east is west) so I spent more than a few minutes getting myself oriented properly to how the Rock sits in the world. Which way do you think the Rock “points”? 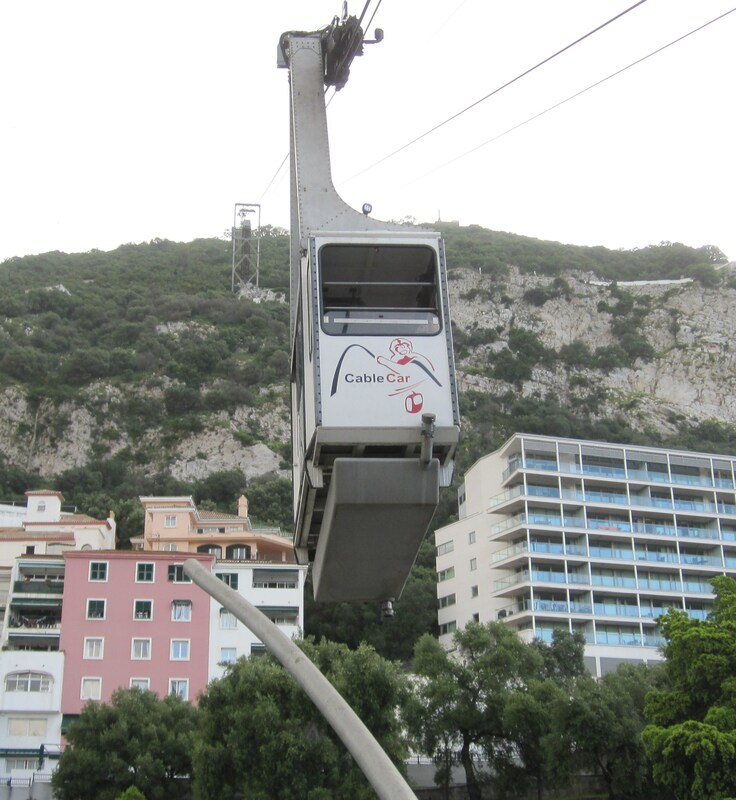 Cable cars take visitors to the top of the 1,400 foot peak. Looking north from the ridge of Gibraltar, you can see Spain and bays on both sides of the peninsula. My assumption has forever been that the highest point of the Rock was pointed south toward Africa, as if the slope was the ramp up from Europe, and the peak were the last support for a bridge across the Strait to the other continent. Imagine my surprise to see that the highest part of the peninsula was closest to Spain and the descending ridge looked more like a sledding run down to the sea level tip that just failed to reach Morocco. My surprise was partly to learn the correct orientation, and partly to realize that rearranging my mental map was so disruptive for me! Gibraltar is a tiny colony, just two and a half square miles of Britain on the edge of Spain. The Rock itself contains a large natural cave system (limestone, remember). Thanks to the peninsula’s strategic military potential, it now contains over thirty miles of tunnels built by the British in the 18th century during various battles and the Great Siege which ended in 1783. The scant, flat skirt of village which lies close to sea level at the base of the Rock looks like any coastal village of Spain, Portugal or the Canary Islands. Only the youngest monkeys look really cute.This adult had the same grumpy expression as the rest. Most of the peninsula is a nature preserve where semi-wild, tailless monkeys roam free. The monkeys hop around on the trees, stairs, railings and walkways of the visitor viewpoints. Generally they do not bother people but any rustling plastic bag or digging in handbags is their instant signal that food is available. Either of those brings them running, perhaps jumping onto your shoulders or pulling at the bag. They run all over tour buses too, and do “swing by” damage to windshield wipers. How do the 30,000 inhabitants make a living on such a tiny locale? The Atlantic-side bay of Gibraltar is filled with large ships; this is the largest Mediterranean port for outfitting and fueling ships. On land, banking and internet gaming are the main businesses. Our guide told us that Gibraltar helps people “not with tax evasion but tax avoidance”! Most of the gaming customers play from Australia or the UK – but I expect the Gibraltarians (rhymes with libertarians) are not fussy about clients’ origins. Business is business, and all have an equal opportunity to lose money. 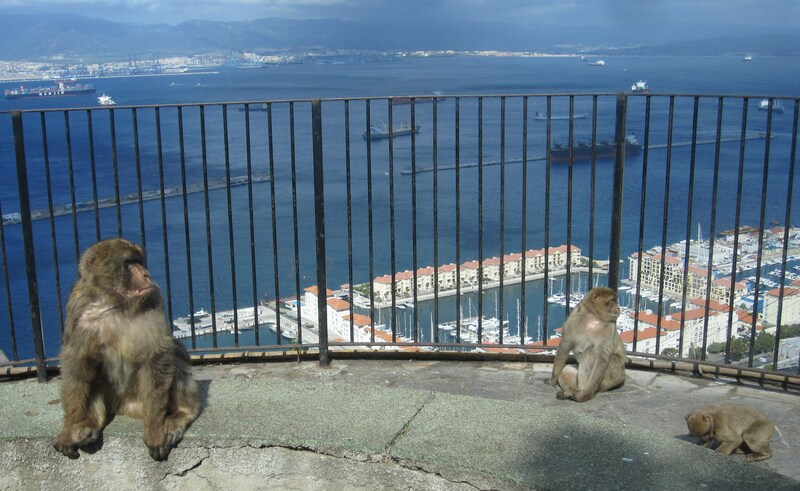 Family of monkeys lounges at a viewpoint overlooking the ships refueling in Gibraltar harbor. 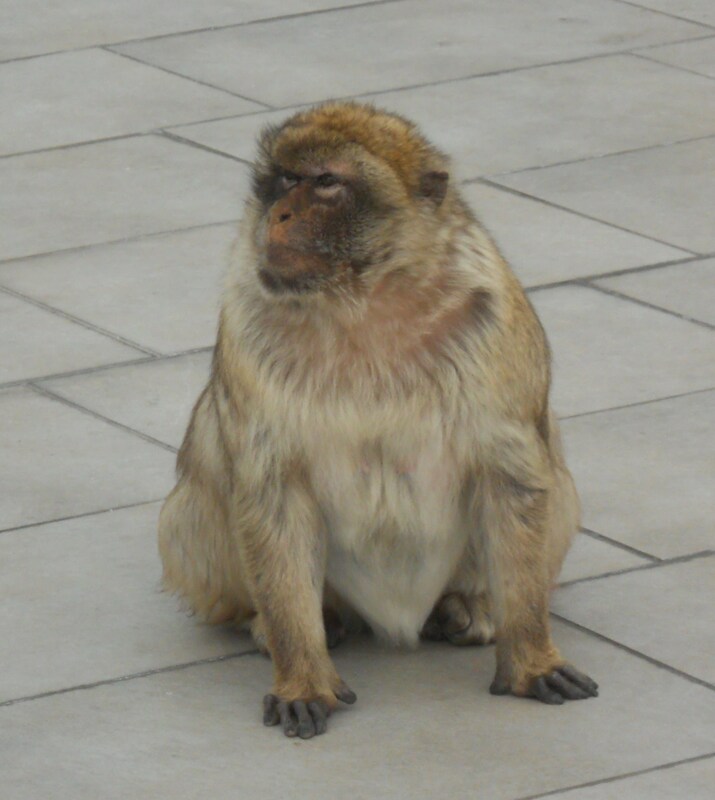 This entry was posted in Travel, Uncategorized and tagged British, Gibraltar, monkeys, online gaming, surprise, travel. Bookmark the permalink. I, too, always assumed the rock pointed toward Africa. And driving on the right side of the road? Now you’ve got me really confused. This great description doesn’t come close to how I envision Gibraltar (except for the monkeys). Add to that my Boston upbringing – I may have lost my accent, but I ever knew until recently that there’s an “r” at the end of Gibralta.